Last weekend witnessed several rallies sponsored by the group Reclaim Australia, and counter-demonstrations by opponents who contend the organization's supporters are racists. Reclaim Australia claims to be a non-racist group advocating "equality and tolerance of all races and religions," and opposing what it sees as the growing influence of Islam and cultural relativism threatening traditional values like free speech, gender equality, and religious equality. Counter-demonstrators condemn it as supportive of racism, fascism, and Islamophobia. Other sources claimed the total number of protestors in Melbourne was 500 (here and here). Whatever the number, the demonstrations there degenerated into a riot. Sporting signs with statements like "No Racism, No Islamophobia," and condemning the hatred of Reclaim Australia demonstrators, counter-demonstrators hemmed in the former and threw a flurry of punches at them. Police used pepper spray to disperse the crowd, and arrested at least four people. Reports have not indicated which side(s) those arrested were supporting. 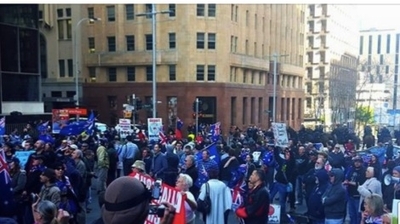 Reports from Sydney indicate at least one person supporting Reclaim Australia tried to "slip into the anti-racism protest," and that counter-protestors chased demonstrators draped with Australian flags. Police arrested five people, one of whom, a woman, was arrested for assaulting police. 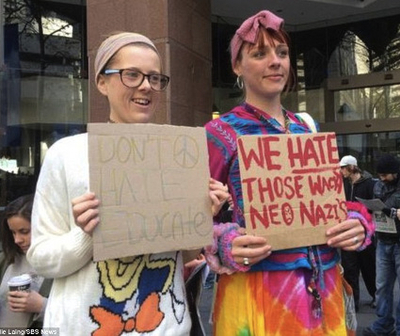 According to the Daily Mail, "It's believed the woman, who was the first arrested, was among anti-racism protesters who turned up to oppose Reclaim Australia." Police "wouldn't say with which group the arrested people were rallying." Two men were arrested in Perth. Western Australia Police Inspector Mal Anderson reportedly said he "believed both [arrestees] were from the socialist alliance group."